Black currant is the edible berry of a shrub, growing in clusters. The fruits are round about 1 cm in diameter, with a thin, often translucent skin enclosing a number of seeds in a juicy flesh. The currants are grouped into three groups based on colour; black currant, red currant and white currant which is seedling from red currant and lacks red pigment. 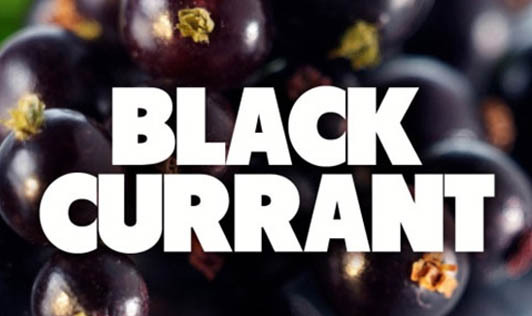 Black currants are known for their astringent taste which adds flavour to many dishes and beverages. They also contain high grade pectin substances and are extensively used in the preparation of jellies and fruit preserves. The taste of blackcurrants is very sweet and sharp and hence used to make blackcurrant juice or added to desserts / sauces. Currants are rich in vitamin C and have a high content of antioxidants. Vitamin C is vital in improving iron absorption for vegetarians. Studies show that the vitamin C in blackcurrants is particularly stable. Blackcurrant seed oil contains essential fatty acid known as Gamma linolenic acid (GLA). Blackcurrants are also MAOI (mono amine oxidase inhibitors), and may therefore be used in therapies against depression, under supervision. Blackcurrant skins contain pigments called anthocyanins which give them their distinctive dark colour. These pigments are known to inhibit bacteria such as E.coli - a common cause of stomach upsets. Anthocyanins are also anti-inflammatory, which is why a blackcurrant drink soothes sore throats. Iron is an important mineral in black currants, providing 20 percent of the daily value along with protection against immunity deficiencies and fatigue by transporting oxygen to cells. Also present are copper, calcium, phosphorus, manganese, magnesium, and potassium for optimal cell, tissue, and organ function in the body. Flavonoids like betacarotene, zeaxanthin, and cryptoxanthin help lower the risk of lung and mouth cancers, protect against neurological diseases, slow the aging process, and fight inflammation.